The Huggable series is an adorable way to wrap up treats for Easter, birthdays, babies, and more! Each character from the Huggable series coordinates with the Tag Sale: Huggable die. 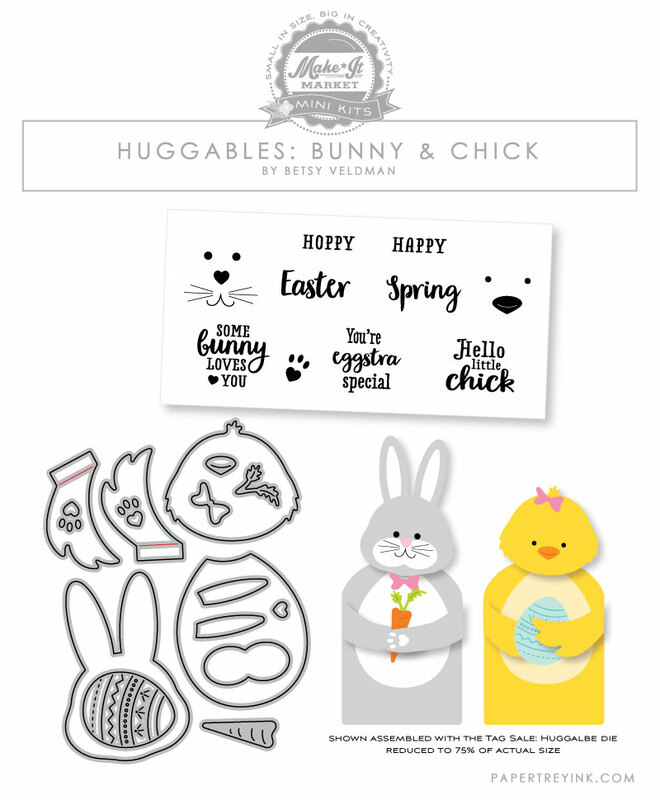 Use the stamps and dies from the Huggable: Bunny & Chick set to turn the Huggable tag base into two sweet spring characters. Wrap their arms to “hug” all sorts of treats including gift cards, candy, mason jars, and more. Or, tuck a sentiment under their arms for adorable interactive cards and tags! STAMP DETAILS: This set comes on a single 3×4 acetate sheet. The “spring” sentiment measures 1-1/4” wide and 5/8” high. The “hello little chick” sentiment measures 1-1/8” wide and 7/8” high. The “some bunny…” sentiment measures 1-1/4” wide and 1” high. The paw print measures 3/8” wide and 1/2” high. The chick beak measures 1/2” wide and 3/8” high. The bunny whiskers and mouth measure 1-1/4” wide and 3/8” high. DIE DETAILS: Contains a total of 16 dies. The Garden of Faith set is filled with touching sentiments and verses that are perfect to pair with your favorite flower stamps! The sentiments in this set are a wonderful source of encouragement for sympathy, get well, thinking of you, and more. They are also great for Bible journaling, bookmarks, and other heartfelt gifts. STAMP DETAILS: This set comes on a single 4×6 acetate sheet. The “Consider the Lilies” sentiment measures 2-1/2” wide and 1-1/8” high. The “& how much more…” sentiment measures 1-5/8” wide and 1/2” high. The “You shall be like a watered garden” sentiment measures 3” wide and 1” high. The “He walks with me…” assembled sentiment measures 2-1/8” wide and 2” high. The “The grass withers…” sentiment measures 1-7/8” wide and 2-3/8” high. The larger stem measures 1-1/4” wide and 3/8” high. The Seasonal Border series is perfect for stamping pretty borders and more! 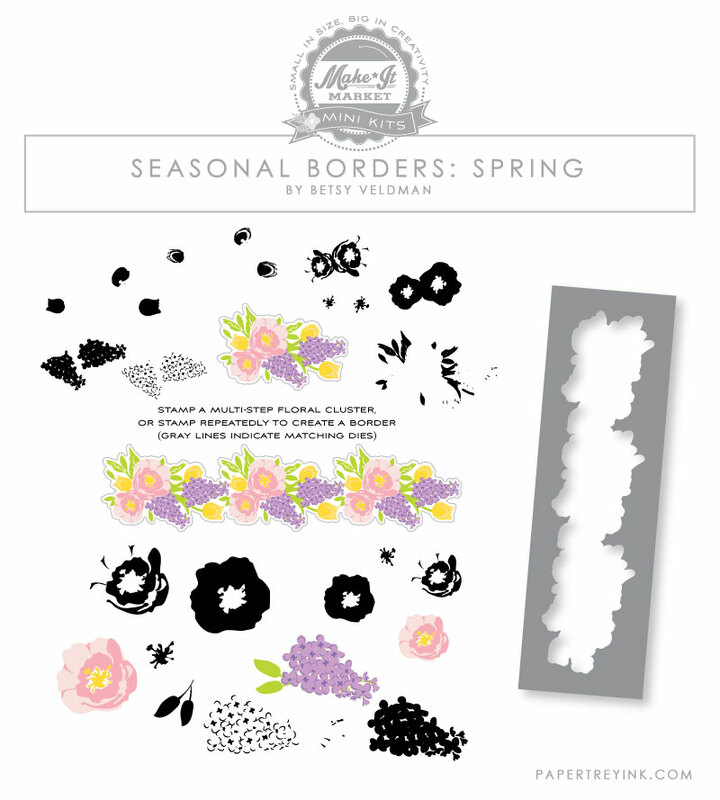 The Seasonal Borders: Spring set features stamps to create a multi-step floral bouquet, which can be stamped just once for a pretty accent, or stamped repeatedly to create a border. There are also some individual multi-step flowers that can be used to create larger bouquets and focal points. STAMP DETAILS: This set comes on a single 4×6 acetate sheet. The assembled bouquet measures 2” wide and 1-1/4” high. The larger individual bloom measures 1-1/4” wide and 1-1/8” high. The smaller individual bloom measures 3/4”. The individual lilac measures 1-1/2” wide and 1-1/8” high. STENCIL DETAILS: Contains a total of 1 stencil. This die collection coordinates with the flowers and clusters in the Seasonal Borders Spring stamp set.